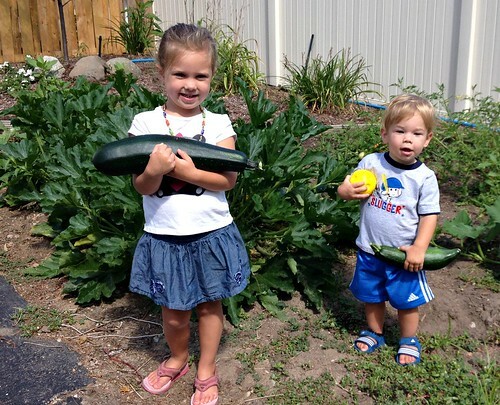 This time of year, I’m ALWAYS looking for new recipes to use up the mass amounts of extra zucchini from our garden. We only have 2 plants, and I’ve already given a bunch of it away to neighbors and family members, but even still, we have lots and LOTS of zucchini! The kids are having fun helping me pick the zucchini, and I’ve been using my food processor to shred boatloads of zucchini and then dividing it up in 2-cup portions for the freezer. I use those to make zucchini breads, cakes, muffins, etc. all year long. Since Dave and I are both big chocolate lovers, I’ve been on the lookout for new zucchini recipes that uses chocolate chips. 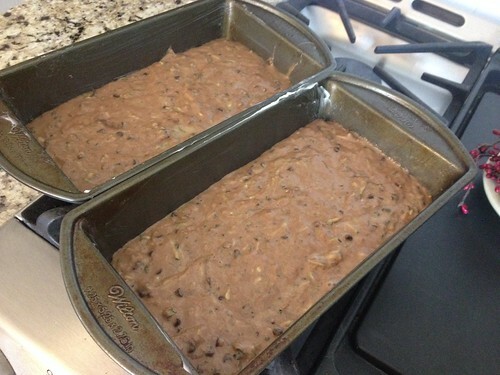 I know how much we all LOVE my chocolate chip banana bread recipe… so I figured chocolate chip zucchini bread would be pretty tasty as well. 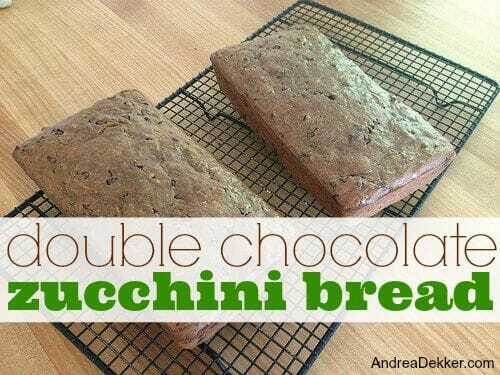 I compiled a few different recipes to come up with this double chocolate zucchini bread recipe… and so far, it’s been a huge hit with our entire family. If you’re looking for a new recipe to use up some extra zucchini, you’ll definitely want to give this one a try! 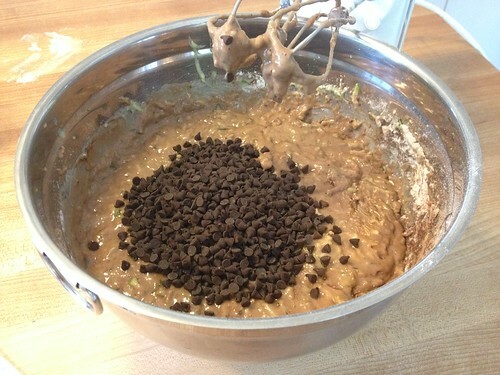 In a large mixing bowl, mix all ingredients together (except chocolate chips) until dry ingredients are moistened. Try not to over-mix. This bread is FABULOUS warm out of the oven; however, it’s also super tasty for several days after baking as well. And of course, it freezes really well too! What are your favorite ways to use zucchini? I wanted to try this recipe but got stumped on the 1/2 brown sugar ingredient. Is is suppose to be 1/2 cup brown sugar? Wow, just tried this recipe to use up some extra zucchini (you know, before harvesting even *more*) and can I just say — it’s not “decadent”, it’s “dekker-dent”. Yum! Yes, it’s ALWAYS watery after you freeze it, but that’s totally fine. I’ve never had an issue using the water zucchini — but you could also try draining some of the water off if you feel your bread is too mushy. While the double chocolate zucchini bread looks amazing, I love your tip of bagging up grated zucchini for using throughout the year…. Saw this just after reading your post. Here’s another good way to use up that zucchini! Thanks Kylie — we’ve actually done that before and it’s pretty good! So glad you linked to that recipe. I love it when I find fun things that are not full of gluten and its friends! She included an option for alternative flour! Actually these is sort of what I had in mind with my idea of zuke fritters. How about thin zuke pancakes, like crepes, that could double as tortillas or faux tacos. It’s so hard to find traditional foods in a gluten free form that are not full of junky flour replacements. Thank you for the pizza! We use a spiral veggie gizmo to make “zoodles”. They tend to contain a lot of water so I like to sauté them briefly in a bit of olive oil. We combine them with the usual lasagna ingredients (sans pasta) to make a casserole, or add to a pot of gluten free pasta just before it is done. I have not had much success with gluten free quick breads, but I wonder if the shreds could be used to make a zucchini pancake, not a sweet pancake but more like a fritter. Those are easy with coconut flour. I usually make them with pumpkin. The pumpkin color disguises the rather blah color of baked goods made without flour. I wonder if zoodle cakes would be green? 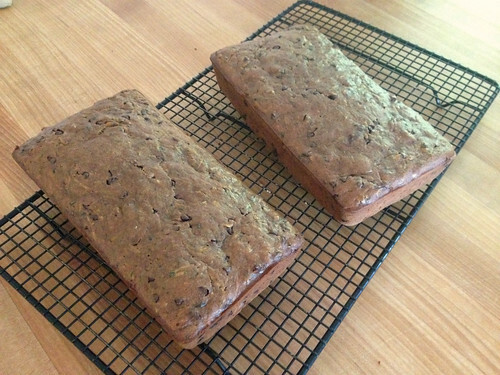 Blueberry zucchini bread is the way to go. I love it and will eat it for breakfast. My niece is crazy for it. I use frozen blueberries (usually that I picked previously in the year). 1) Preheat oven to 350 degrees F (175 degrees C). Lightly grease 4 mini-loaf pans. 2) Bake 50 minutes in the preheated oven, or until a knife inserted in the center of a loaf comes out clean. Depending on what type of pan you bake them in, your time may be shorter. Cool 20 minutes in pans, then turn out onto wire racks to cool completely. 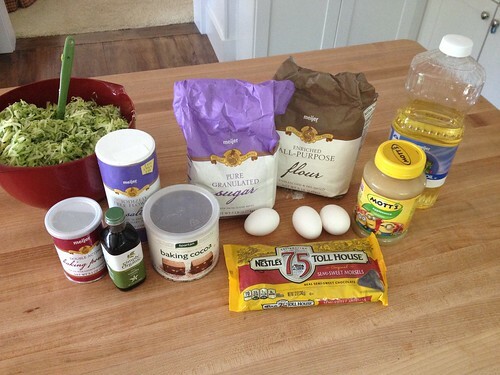 Thanks for the recipe… sounds yummy! 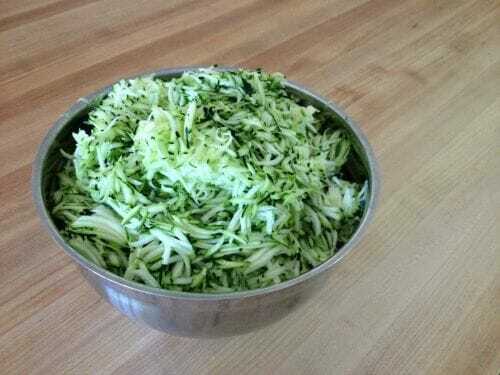 Simmer Zucchini in lemon juice until tender. Add Sugar, Cinnamon and Nutmeg. 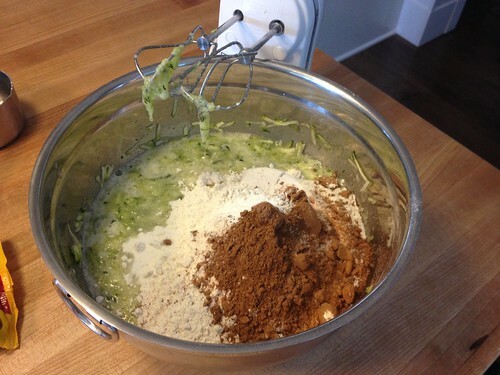 Pour zucchini mixture into 9×13 pan and cover with dry cake mix. Melt oleo or butter and dribble over cake mix. Sprinkle chopped nuts over top before baking. yes, I love that it uses a lot of zucchini and makes 2 large loaves. Wow, that sounds amazing… and really simple! I actually made a “zucchini crisp” tonight and it tasted JUST like apple crisp! I didn’t tell Dave it was zucchini until he was half way through eating it and he was totally shocked. He honestly didn’t believe me at first! Ina Garten has a “crisp” topping that I really love, I have been thinking lately about going there…glad it worked for you….will have to try it.